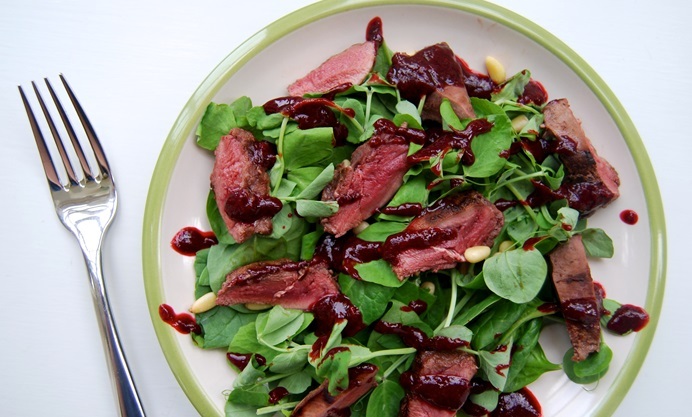 Cheap, lean and gamey, wood pigeon is a wonderful bird to eat as the seasons change. 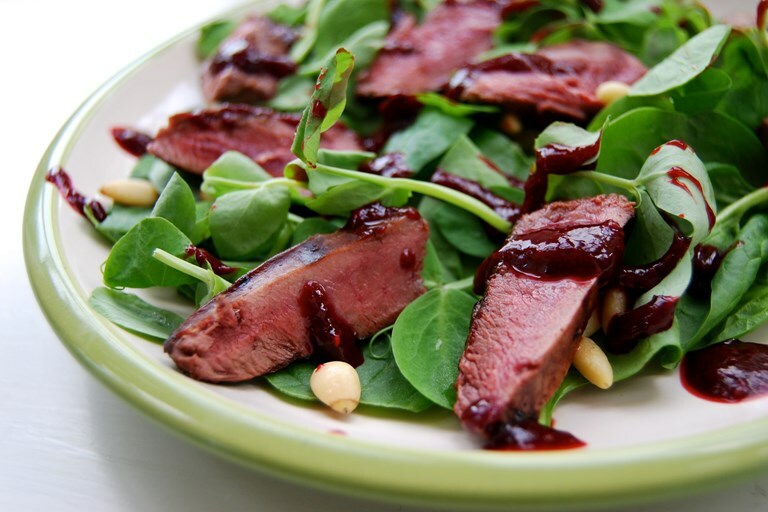 Rachel shows how to prepare pigeon breasts in a tasty and colourful salad. I love eating wood pigeon. It is cheap, lean and gamey, but not in the same overpowering way you can get from pheasant. It is more robust than partridge. Let me just throw out a quick disclaimer for those of you who grew up in the middle of the city, and not in view of rambling fields and woodland like I did: I said wood pigeon. Remove the image of the dirty, pestilential birds that crowd around the pavements in cities, and think of just another bird you’d find in a tree somewhere in Kent or Sussex that is perfectly delicious to eat. 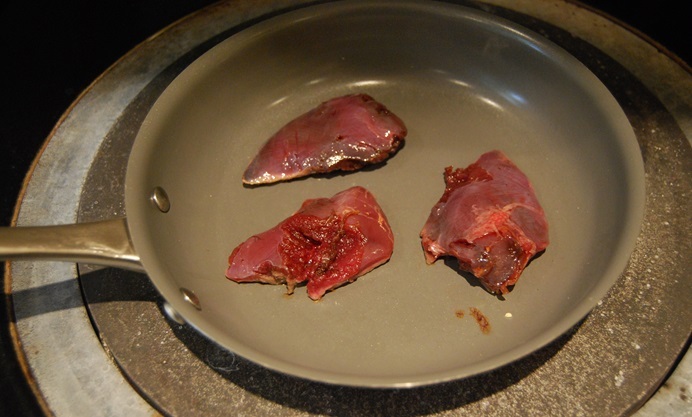 You can find pigeon breasts at a good butcher or farmers market. If you’re in London, I’d recommend Furness Fish and Game at Borough Market; I used to buy all my game and fish there when I was living in London, and their duck sausages are also worth a try. However, if you live out in the country like me on a farm, or you know someone with a farm willing to let you shoot on their land (I can promise you they have a pigeon problem so probably won’t mind. You can get pretty much free rabbits this way, too) you could always shoot your own; all a bird will cost you is the price of the shot. I’ve used our own wood pigeons here, breasts removed the moment the bird has been shot out the trees and quickly stashed in the freezer. While you can keep the whole bird, I find that they are so small that the breasts are the only pieces that are worth salvaging in an effort to food ratio. Pull the feathers from around the breasts while the bird is still warm (they’ll come away easier that way) and with a very sharp knife slice the meat from the breast bone the same way you would a chicken carcass. As pigeon breasts are quite small, I find they’re best for salads. You can pan-fry them with only a few minutes each side, and they still stay lovely and pink inside stashed on a warm plate under some tin foil if you’re cooking up a big batch. I find two breasts are good per person sliced on a salad (though three is perfectly acceptable if you’re all big eaters) for a simple starter, and I like to pair them with something earthy, and something seasonal. 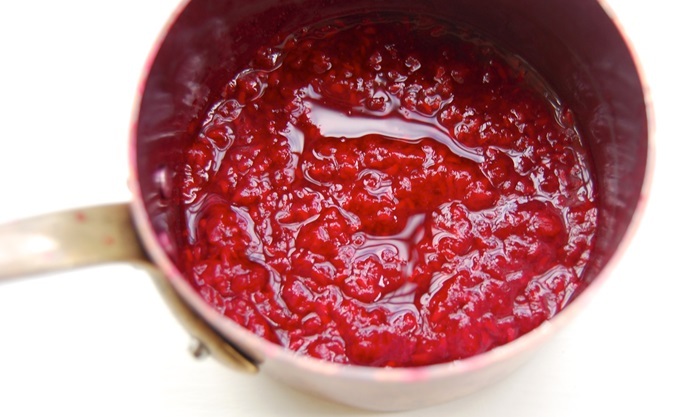 Raspberries are still going strong down in the vegetable plot, and their tart sweetness make a lovely reduction with balsamic vinegar to dress the salad. As you’re cooking them down anyway, look for reduced, almost too soft to eat whole but still okay tubs at the market or at the supermarket. I like toasted pine nuts for crunch, though walnuts would work equally as well here. Pea shoots are more of a personal preference, though they add a nice freshness to the dish (it is only the very beginning of Autumn, after all) and baby spinach leaves add that earthiness that really makes the pigeon sing. Some bitter leaves would work well here, too.